It feels awkward, to say the least. So, like a good sanitary citizen, I was washing my face yesterday. Some sort of Dove Exfoliating Facewash with blue beads that Sally probably bought in 2003 and never used up, so it’s in our bathroom. I scrubbed that beautiful face o’ mine and then began to splash water on it to rinse. You know the drill. I hope. I knew in one fateful moment that I had a serious problem on my hands. As my fingers ran over my eyelids, I realized that I had drug soap into my eyes. At that point, I began to rapidly splash water into my eyes because they were BURNING LIKE FIRE. Thinking nothing was wrong, except that my IQ level drops daily, I headed off to school. By evening, this appeared. 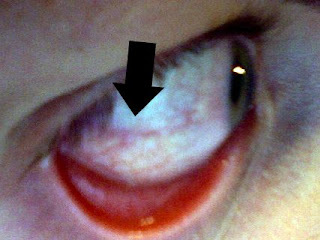 A bloodshot left eye with one good solid red streak down the middle. 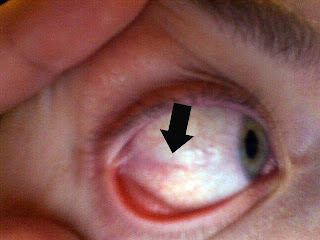 Need another close up view of said eye? Yeah, that’s not good. It’s itchy and sore and leaky. And awkward feeling. But what is worse is when, at 5am, you wake up to your eye being COMPLETELY sealed shut by gunk. I mean, “Oh my gosh if I try to pry this puppy open I will lose all my eyelashes” sealed. G-ross. Luckily, I had taken out my contacts and am happily in my sassy glasses. That would have been wicked sick to deal with that gunk plus a foggy contact lens this morning. Because I don’t like paying to go to a doctor, I went to the school nurse. Call it “Workplace Health Care”, if you will. She immediately assessed the situation- scratched eyeball. [You don’t say.] It was one of those stupid exfoliating beads. Nice work, bead. And she said if it still is gunky tonight and hurting tomorrow, she will make me wear a PATCH. A. Pretend it doesn’t hurt so I don’t have to wear a patch. B. Pretend it does hurt so I get to wear a patch. I’ll let you know what this little pirate decides tomorrow. Time to let the ole peepers have a rest.